through my hands: Blueberry Pie for Breakfast Anyone? Blueberry Pie for Breakfast Anyone? Actually, the kitchen is now OPEN for business. LOL The remodel is nearly done. The electrician is scheduled to arrive any minute now to finish the last part. 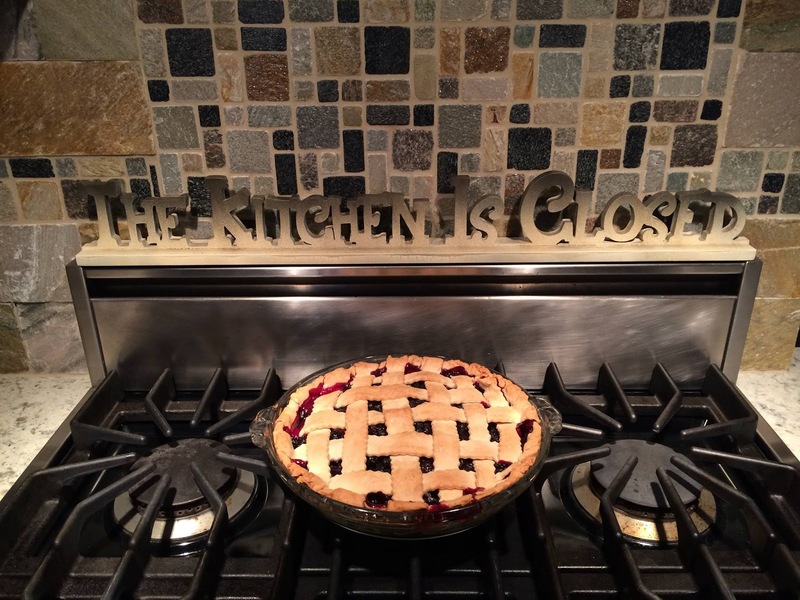 Yesterday the stove was placed back in the kitchen and to celebrate, I baked a pie! After not having a stove/oven for 12 weeks, I was itching to use it and start to feel normal again and my blueberry bushes offered us a wonderful bounty this year. So although it is Friday and not Monday, I am including a wonderful Blueberry Pie Recipe for you to try. My blueberries were picked fresh from our bushes but you could use frozen as well and it will still be wonderful. Rinse blueberries right before you are ready to use and drain well. If using frozen blueberries, put your hand in with the water and make sure that the frozen berries are not sticking to each other. Place blueberries in large bowl and pour lemon juice on top and gently mix. Mix sugar, cornstarch, salt, and cinnamon together and sprinkle on top of blueberries. Gently mix until all of the dry ingredients are moistened and mixed with blueberries. Pour blueberry mixture into the crust and dot with butter. Cut remaining pastry into 1/2 inch wide strips and weave back and forth to make lattice top. Crimp edges and press with fork to flute edges. Cut 3/4 inch strips of Reynolds wrap freezer paper and cover edges of pie crust to keep edges from browning too quickly. Bake pie on 'middle' shelf of oven for 50 minutes and then remove Reynolds wrap from edges and bake an additional 10 minutes. Check for desired brownness of crust. In my oven, I ended up baking my pie for a total of 70 minutes. Remove from oven and allow to rest for at least 1 hour! This is important. If you do not allow the pie to rest properly, it will not have time to set up and when you cut into it, the juices will flow out and all over your plate. The taste is still good but you should really wait so that the cornstarch has sufficient time to set the liquid.